The best thing about the DSC-H50, as far as I’m concerned, is its image-stabilized, 15x optical zoom lens. That’s a 35mm equivalent of 31mm to 465mm, a hell of a zoom capacity, especially on a camera this small and light. (However, recent entries in the superzoom market from Kodak, Olympus and Nikon have upped the zoom ante to 24x and 26x. At what cost to image quality remains to be seen.) I loved being able to zoom in on faraway subjects, such as ancestral Pueblo cliff dwellings from distant overlooks. I could see details through the zoom lens that I could not see with my naked eye. Who needs binoculars when you have a 15x zoom lens?Image stabilization is critical a crtitical feature for the H50. Without it, shooting at full zoom length without a tripod would be next to impossible. 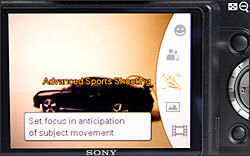 Sony’s Super SteadyShot optical image stabilization minimizes blur from camera movement with a built-in gyro that senses movement and then compensates for it by moving the lens elements. 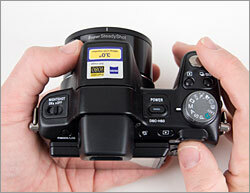 This also means more sharp photos when you’re shooting in low light. The 3-inch, tilting LCD monitor is big, vivid and very useful for shooting from high or low vantage points where you otherwise might not be able to see the display. It’s the first time I’ve used a camera with a tilting LCD and I liked it a lot. However, I did wonder why Sony didn’t go one step further and make it a swivel LCD so it could be viewed from various additional angles. I’ve seen other cameras with LCDs that tilt and swivel and it seems like that would be handy. The DSC-H50 has a full range of exposure modes, from Easy to full manual, with program auto, shutter priority, aperture priority and several scene modes in between. This makes it an ideal family camera: Set it to Easy mode and hand it to your kid to fool around with; set it to Auto Adjustment or a scene mode like Portrait for your spouse; set it to Manual when you want total creative control. Intelligent Scene Recognition, Face Detection and Smile Shutter are much-touted technological innovations that are great — when they work. In my experience with this camera, Intelligent Scene Recognition worked reasonably well; Face Detection worked so well it even recognized faces in artwork; and Smile Shutter was unreliable at best. Personally, I think Smile Shutter is rather silly, anyway. Is it really so difficult to observe your subject and push the shutter button when they smile? What would be more useful, I think, is if camera makers developed an Eyes Open feature that only takes pictures when all subjects’ eyes are open. Night Shot is an interesting concept, although I’m not sure I entirely understand it. The manual says: “The Night Shot function lets you shoot subjects in the dark places without using the flash.” Switching Night Shot on reveals a display message that says, “Illuminate subject using infrared light in low light,” and turns on a faint, red light on the front of the camera. Experimenting with Night Shot around my dimly lit house at night, I captured grainy black and white photos with a greenish cast. I prefer the color results I got using Auto Adjustment with the flash turned off. Besides offering a slightly faster shutter speed in very low-light situations, the only real benefit I can see to Night Shot is that its infrared lamp illuminates subjects without the red glow of the focus lamp. This could be useful during theater performances – or perhaps special ops missions in “the dark places” referred to in the manual. The included remote control is a fantastic accessory – one that quickly convinced me all cameras should come with them. It makes shooting group and self-portraits easy as pie. Just set the camera up on a tripod or other solid surface and set the exposure mode and zoom length, then go pose. When you’re ready, push the shutter button on the remote. Change poses, push the shutter button again. And again. It will keep taking pictures: No self-timer or running back and forth necessary. According to Sony’s specifications, the DSC-H50 weighs 14.6 ounces (415 g) without the battery and Memory Stick and 1 pound, 3.3 ounces (547 g), with them. It measures 4 9/16 x 3 3/16 x 3 3/8 inches (116.1mm x 81.4mm x 86.0mm). In real-life terms, this translates to a camera that will fit in a medium- to large-sized purse or pack or that can be worn on a neck strap with little weight penalty. It will not fit in a pocket, unless you have especially roomy jacket pockets. Compared to an average DSLR camera body with a kit zoom lens of 200mm or so, the DSC-H50 is a real space-saver. And a somewhat comparable DSLR zoom lens like the Nikon 80-400mm AF-S VR zoom would weigh three pounds – camera not included. It’s hard to pinpoint why, but this camera does not feel particularly comfortable in my (large-ish female) hands. It’s very difficult to hold or even pick up left-handed, and although I am right-handed, there is really only one way to hold it that feels secure, which is with the right-handed grip. And even that isn’t really comfortable. This lack of ergonomic ease is only a minor impediment, but it does contribute to my sense that this camera is not the best fit for me. I’ve used other compact digital cameras that felt much more comfortable in my hands. 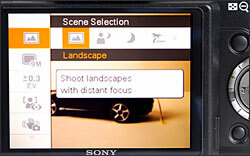 The mode dial on top of the camera accesses exposure and scene modes. The control button’s four-way navigator allows you to quickly select settings for focal length, self-timer, flash and how much information is displayed on the LCD. 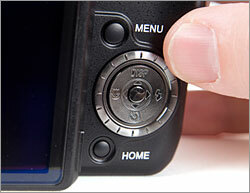 The wheel dial around the control button lets you adjust ISO, shutter, aperture and other manual options.